This is an alternative to traditional burial in a Churchyard or Private/Municipal Cemetery. It is considered a more environmentally acceptable form of committal. 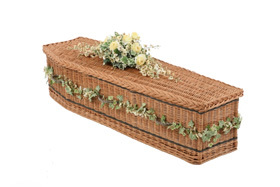 Commonly, Meadow or Woodland Burial Grounds prefer the coffin to be constructed of material that is easily biodegradable or environmentally friendly e.g. Willow, Bamboo or cardboard. Some burial grounds will permit a solid wooden coffin, with wooden handles and a wooden name plate. Our wooden coffins are sourced from a local manufacturer. Most Burial Grounds will not permit memorials so the area remains in its natural state to preserve a wildlife haven. Some Burial Grounds may permit a tree to be planted over the grave and a simple wooden marker to commemorate the deceased. They may also have an area in the Burial ground which is designated for interment of ashes. Most Woodland or Meadow burial grounds are privately owned, but there are some Local authority run cemeteries which will have an area designated for Green burial. Please speak to us for details and location of local cemeteries or Burial grounds.